Hit a Home Run with our personalized baseball wall decals! This monogram baseball sticker will be made to order with the name of your choice! Shown here in our matte white, but available in all of our colors! 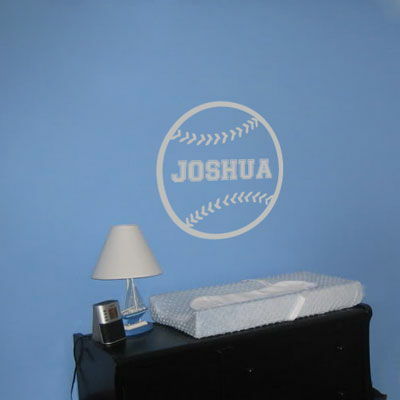 Our baseball wall decal measures 22 inches in diameter and the one name of your choice will be made to fit inside. Need a different size? Looking for something else? Just contact us! Dali Decals … I am in love with your product! After initially ordering your 6 piece turtles in pistachio matte, I installed them on my son’s nursery wall only to find they weren’t exactly the right color. I called your customer service and spoke with one of your fabulous representatives who took the time to help me pick out the right color to reorder. I was hoping to get the replacements “soon”, little did I know they’d show up THE NEXT DAY! The new “olive” turtles are up on the wall and we LOVE them. Thank you so much for going out of your way to provide exceptional customer service, you have a new customer for life! … We are already planning on our next order for our spare bathroom.